Semi Automatic Capping Machine is controlled with digital indication, which is directly legible. Height of its capping mechanism is easy to adjust using a hand wheel. Bottle positioning mechanism controlled pneumatically and electrically is easy to operate. Adjustable capping torque effectively protects caps from damage by adjusting tension depending on different caps. 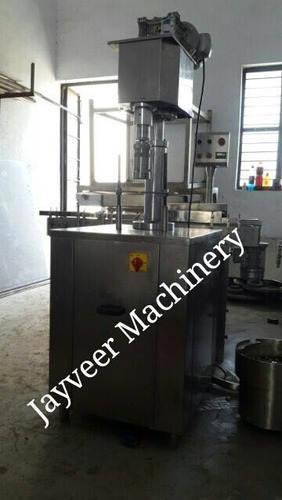 We “Jayveer Machinery” is a foremost manufacturer and supplier of a highly efficient range of Filling And Sealing Machine, Automatic Sticker Labeling Machine and Bottle Washing Machines etc. Incepted in the year 2012 at Ahmedabad (Gujarat, India), we have developed a well functional infrastructural unit where we manufacture these products in an efficient manner. Offered products are manufactured making use of premium quality components and latest techniques. Under the headship of our mentor, “Mr. Akash Patel”, we have been succeeding in this domain.